Hotel Royal Saint-Germain is perfectly located in the heart of Saint-Germain des Prés and Montparnasse area. By metro, you are only at 10 minutes far from Porte de Versailles Exhibition center, Louvre Museum and Champs-Elysees Avenue. You come with your own car : a public and safe parking is next door to the Hotel. You can have a special rate (15 Euros/24 H). 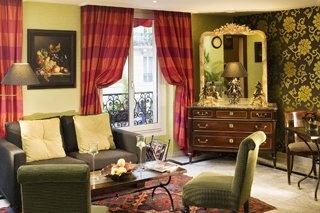 Warm welcome, helpful, Hotel Royal Saint-Germain offers the all comfort of a 3 stars hotel. Fully air-conditioned, free wireless internet, connecting rooms, non-smoking floor, buffet breakfast. For reservations, please indicate the code "CHAF12", you will receive a reception dedicated to the bar and our best prices.